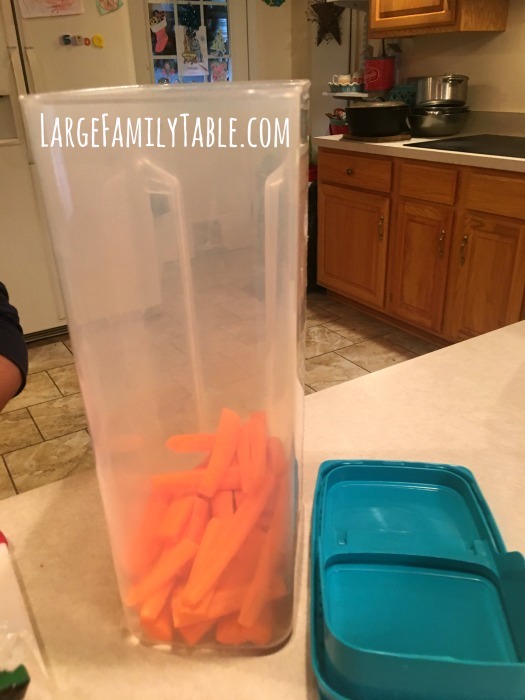 Large Family Snacks | How to Keep Fresh Carrot Sticks for Days! 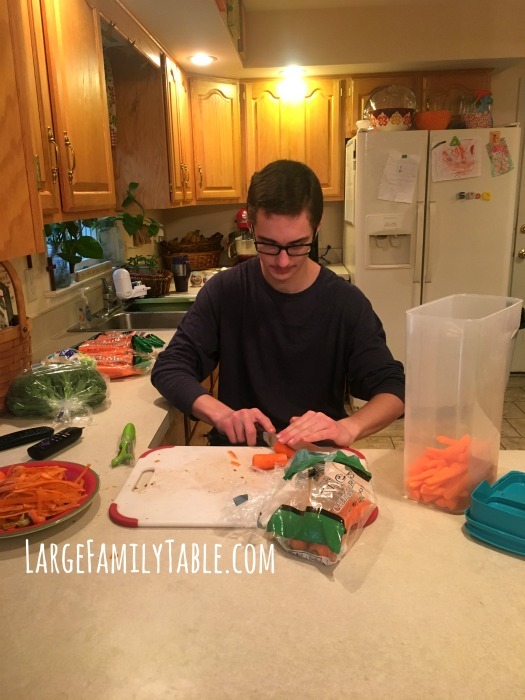 I’ve shared recently in my Large Family ALDI Trim Healthy Mama Grocery Haul | Plus, One Week Large Family Meal Plan! 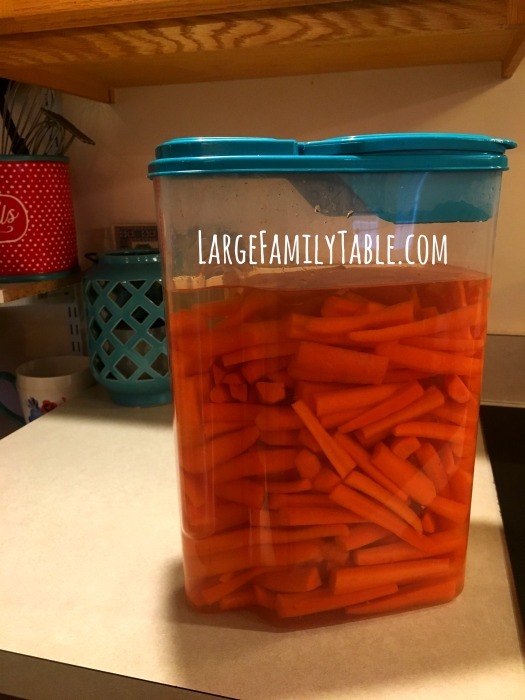 how we keep fresh carrot sticks available as a large family snack option. Several moms wanted to know how this works for us and I’ve finally gotten around to sharing. There’s not too much rocket science involved, and I think once you try it a time or two you’ll find it’s worth the effort for such a cheap snack to have on hand. Carrots have been around $0.75/lb (I get 2 lb bags at Aldi for about $1.49/bag), which makes this bulk snack come in at about $6! As a root vegetable carrots are durable and very forgiving. When I bought our last 8 .lbs of carrots at Aldi, they sat in the refrigerator for a least a week before we finally got to process them. I’ve had times where the carrots have stayed in the fridge for several weeks before we could get to them and they were still in perfect condition. Three cheers for carrots!!! 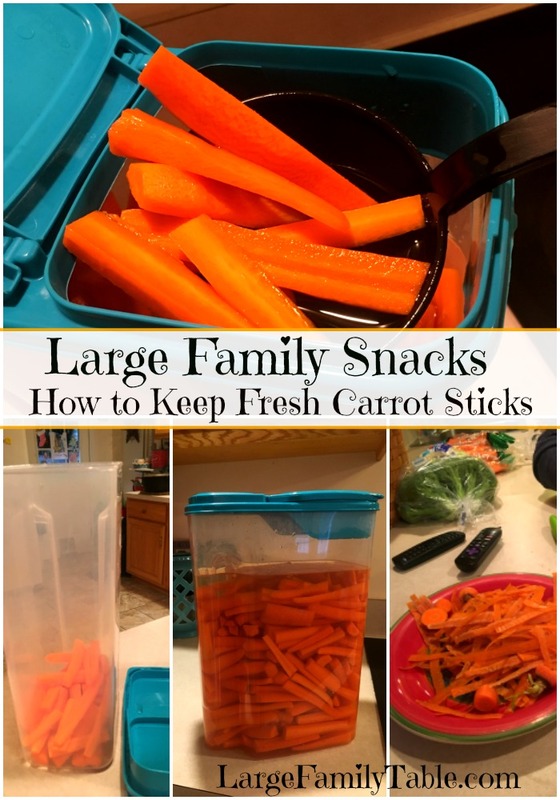 The idea behind keeping plenty of fresh carrot sticks on hand is to give a healthy snack option that’s quick for mom to dish out or older kids to get on their own. Don’t worry, though, this is not a free-for-all with everyone’s grubby hands in the pickle jar so-to-speak. I have a few simple steps that I also share below to make fresh carrot sticks in water work for a family with many helping hands. Amazon affiliate links are used in this post. These links help support the work of this site. Thank you! 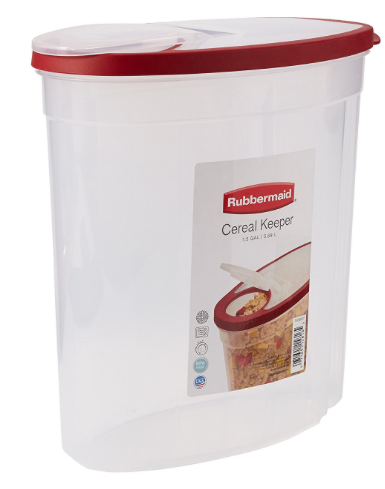 The first thing I did was purchase a large Cereal Keeper type container like this one here on Amazon. I figured it could easily hold 8-10lbs of chopped carrot sticks, and I was right! I’m focusing on carrot sticks in this post, but you can also do celery sticks. One reader told me she does radishes, too. 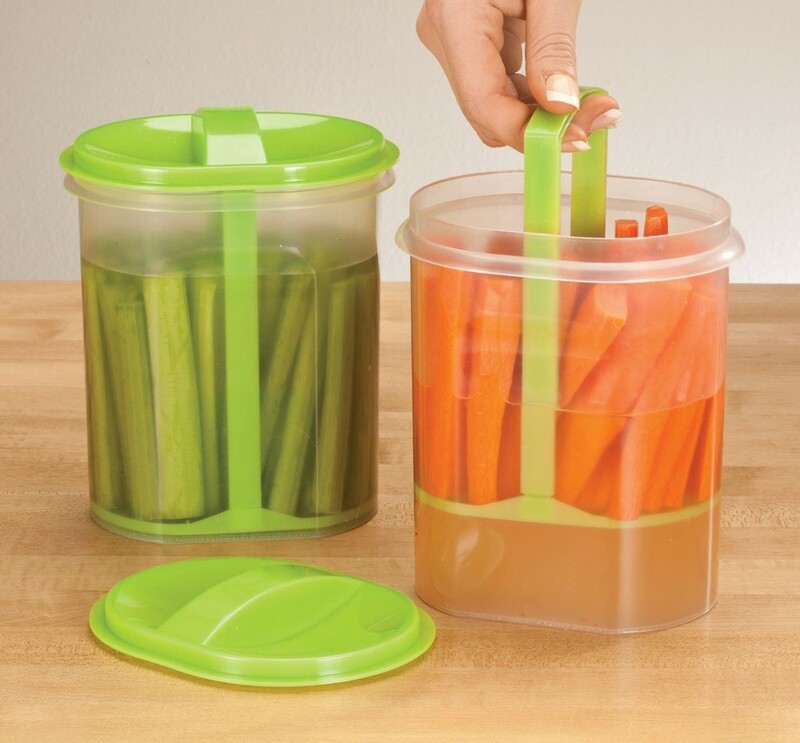 Another option is to purchase something similar to this celery and carrot stick holder. I’ve heard from several YouTube viewers that this set works well for them. I feel this set is too small for my crew, but it may be perfect for yours! Just pick whatever container would work for your family’s snacking needs! What About the Carrot Water? One question I’ve received a few times is, “What about the carrot water? Do you just throw it out?” If you keep lots of hands out of the water, you can use it for vegetable stock if you’d like! You could add some in with a homemade chicken soup that you make primarily out of leftovers, too. Now, this is where having a teenager or two around comes in handy. If you don’t have one of these helpful humans yet, let me encourage you that one day you will. There are lots of veggies I chop and prep in advance. However, I’ve recently put our 13 (nearly 14) year old on the job of prepping the 8+ lbs of carrots I like to buy. He puts his favorite music on YouTube and gets to chopping carrot sticks. First, he washes and peels the carrots. Then he sets about the work of slicing each carrot into 4-6 sticks depending on size. The carrot tops and peels could be frozen to make homemade vegetable stock later. I used to feed our scraps to our chickens (hoping to get back into chickens this spring 🙂 ). Sometimes I freeze the scraps. Sometimes I pitch them. It just depends on how my pregnant lady hormones swing that day. How to Use Carrot Pulp from Mother Earth News. This article is referring to the carrot pulp left from juicing. I feel like you could use the ideas mentions with your carrot scraps. He starts to fill our large container that we use for carrot storage with the sticks he creates. All his washing, scraping, and chopping takes a good hour. When you prep veggies ahead in bulk like this it takes time on the front end. However, we’re thankful for his hard work because once it’s done, we have fresh carrot sticks for a week. 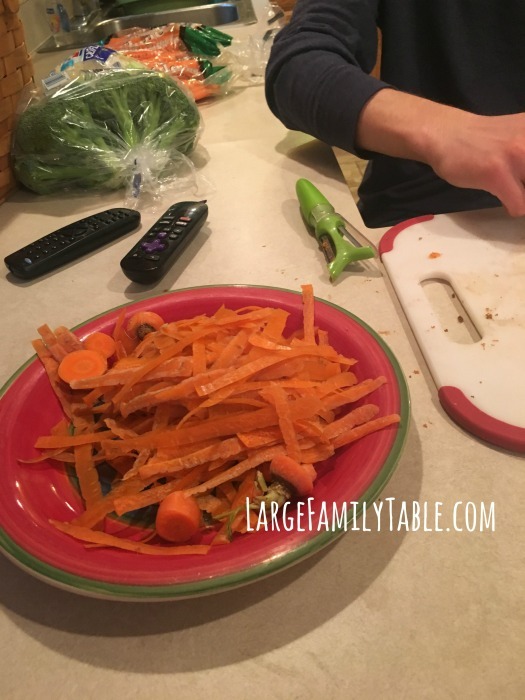 I use the carrot sticks as easy side options for our large family dinners. 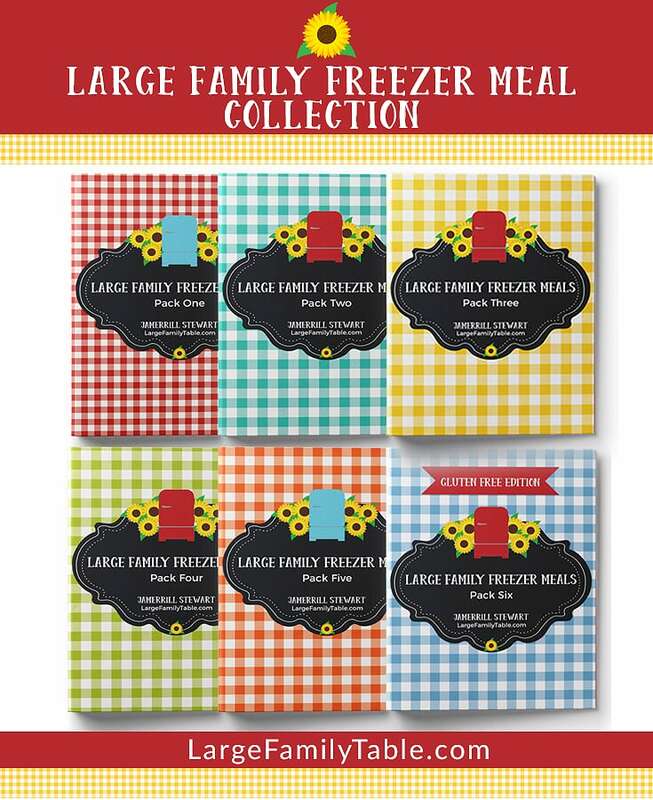 They’re also helpful for large family snacks on the go. This is how 8 lbs of carrot sticks look when chopped and placed in water. Let me say that if you don’t have a teen available to chop you can do it yourself as well. It takes about an hour, but any major vegetable prep usually takes me that long. Just like freezer cooking or large family bulk grocery shopping, there’s work involved, but it’s so nice when it’s done! Now read below for few simple steps to maintain the water on the cleaner side. We keep our large carrot stick collection in our refrigerator door. 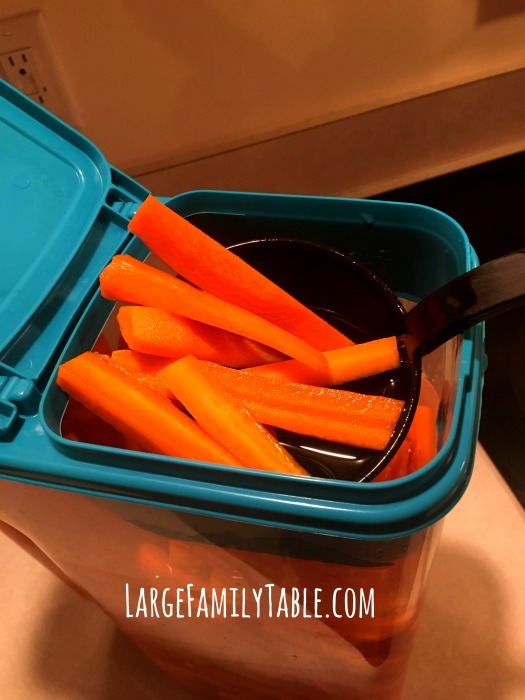 When it’s time for a meal where I’m offering carrot sticks as a side, or we’re using the carrot sticks as a snack with some peanut butter (hello added protein that helps stretch a snack a litter farther) or ranch dip, I just pull our prepped ahead carrots from the refrigerator door. I like to use my slotted serving spoon to dip in the top opening of our large carrot container. This way my hand doesn’t need to enter the container let alone the fresh carrot water. I’m able to put the carrot sticks on individual plates or in a serving bowl from there. On this particular day when I took the pictures for this post, we had just loaded the slotted serving spoon in the dishwasher. I improvised and used my plastic soup ladle instead. This spoon didn’t have the slotted openings for water to drain. All I needed to do was turn the spoon and let the water drain out in the container before serving these carrots. My other simple rule is the younger kiddos (under age 10) can’t get their carrot sticks independently. The container is too heavy, and I don’t feel they can handle getting the carrots out without also swimming in water (remember this meme! #truestory). They can always get bananas, blackberries, and a host of other snacks if necessary and no water temptation involved, haha. If they want carrot sticks, they need to let an older sibling or mom help serve them. Sorry kids, one day you’ll be double-digits! We run through a large counter as pictured above in about 5-days. I’ve heard from some readers who grew up with their family keeping carrot and celery sticks in water that they can last longer than a week, but the water needs changed every few days. Even with our work to keep our hands out of the water I still like to change the water on or about the 3rd day. Well, there you go, friend. I hope it was helpful. Let me know if you try it and how it works out for your family. What are some of your family’s favorite quick and healthy snacks? I have a jumbo potato cutter/julliener that I use for bulk carrots. It’s nice because everything comes out pretty uniform.